I’m going to town on the vegan carrot cake cupcakes you guys! We set a new record in having to do 3 photoshoots to get this one right. We’re no stranger to having to repeat photoshoots, things just do go wrong sometimes. But 3? This was a new record. So in the process of testing this recipe (2 times), and then shooting and reshooting (total of 3 times), I have made these cupcakes 5 times in the past couple of weeks. We are overrun with cupcakes! Not that anyone is actually complaining around these parts. My sister is a BIG fan and comes around to grab a few here and there, and Jaye has his daily cupcake fix, but still, we are overrun! I have an entire shelf of the fridge dedicated to these cupcakes right now. They’re more like muffins with frosting on though I must say. 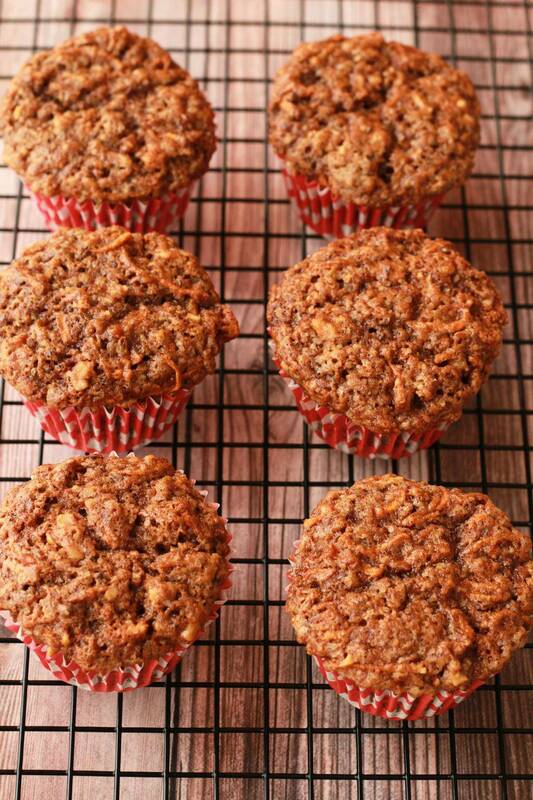 There is something very muffin-ish about them. See how they look above? Like muffins right? 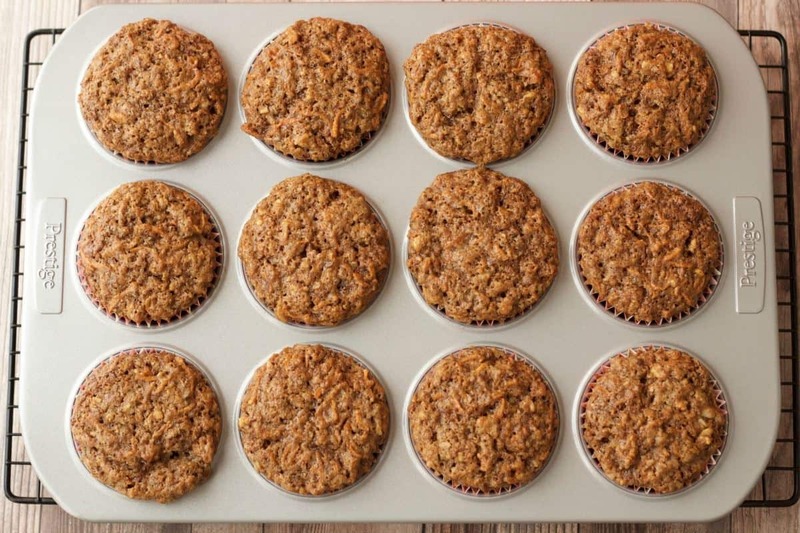 They look like muffins, act like muffins and taste like muffins! What’s the difference between cupcakes and muffins anyway? Is it just that muffins are usually not frosted and are a tad more wholesome? Well these guys taste pretty wholesome! 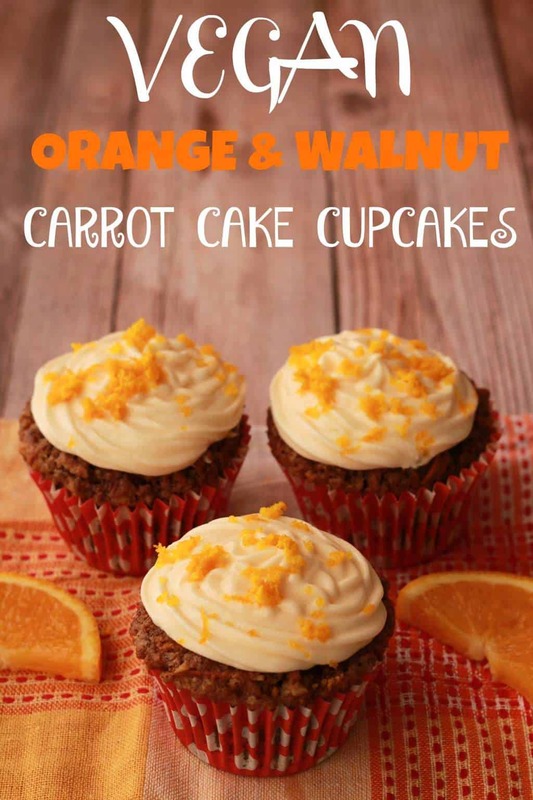 With the walnuts and the orange zest and all that carrot goodness, these definitely give you that wholesome muffin vibe. So you can have them either way. If you want to have them as muffins, just don’t bother to frost them! They are SOOOO good on their own. They don’t actually need frosting at all. But if you want to turn your wholesome muffins into deliciously frosted cupcakes, then frost the little buggers. But don’t misunderstand me when I say ‘wholesome’. They might seem pretty wholesome and I’m very happy with the ingredient list, but let’s be real, baked goods are not really designed to be health food. 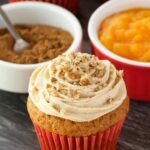 This recipe is based on my other carrot cake recipes, like my vegan carrot cake and my gluten-free carrot cake cupcakes. 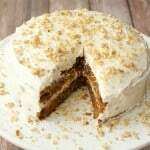 And one of the questions I received about my vegan carrot cake was regarding the relative shortage of wet ingredients. This is because the recipe doesn’t use any added plant milks, so it’s just the oil, flax eggs and vanilla/vinegar etc that provide the wet ingredients. And yes, this is exactly right! This is because the raw carrots added to it – while seeming like a pretty firm, solid ingredient – are actually also a wet ingredient! Once you add in those grated carrots and the moisture starts to seep out into your batter, it gets to the right level pretty fast. Nonetheless you end up with a very thick batter here and that’s entirely okay. In fact it’s what you’re going for. So don’t freak out when it starts out so thick it’s like it’s not going to form into a batter, just stir a bit more and those ingredients will start to merge together and form into a batter. A thick batter, but a batter nonetheless! However, I always recommend weighing out your flour. It’s the trickiest measurement in baking and for the best accuracy, it’s always worth weighing it out on a kitchen scale. 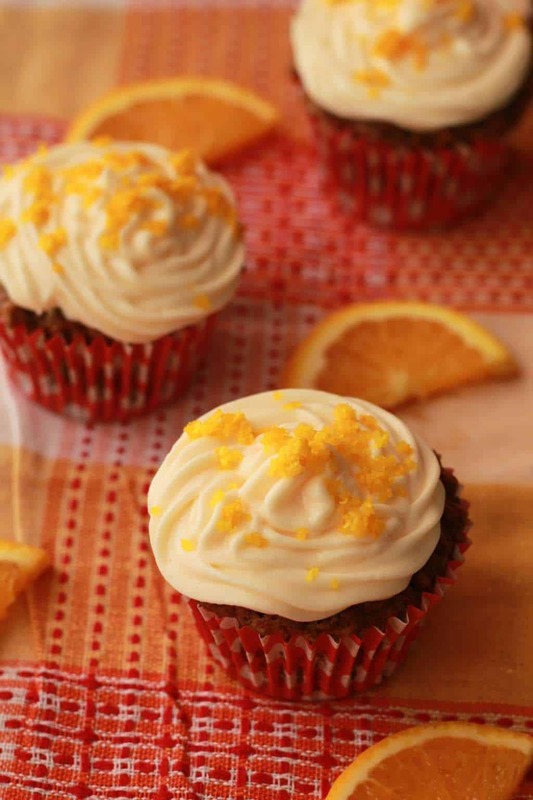 The frosting gets its delicious orange flavor from fresh orange juice and a little orange essence. 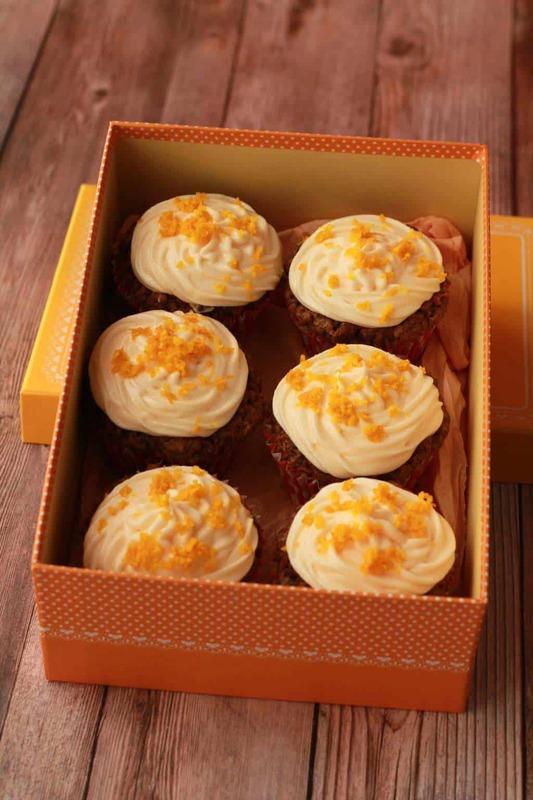 And then you top it off with some orange zest which not only looks gorgeous, but intensifies the orange flavor beautifully! 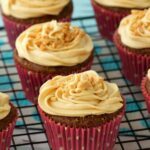 The good thing too is that these vegan carrot cake cupcakes lose none of their moistness or flavor when kept (covered) in the fridge and they last for at least a week, though of course the fresher the better. Something to note is that these cupcakes take a little longer to cook than my other cupcakes. Usually 25 minutes is long enough, but these guys needed 30 minutes to be deliciously browned and perfectly cooked. 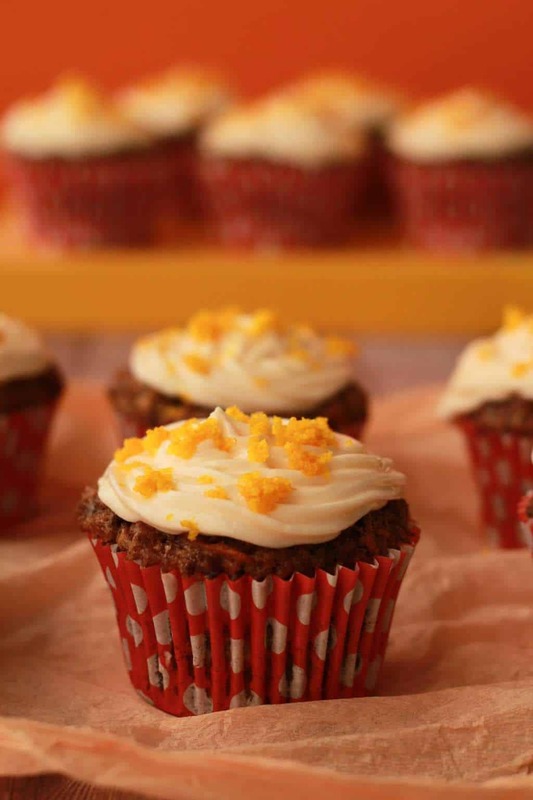 So let me know what you think of these orange and walnut carrot cake cupcakes! And if you have any questions, fire away! If you make these cupcakes, let me know how they turned out! Your comments help everyone! And if you take any photos tag us #lovingitvegan on instagram so we get to see them. And, if you’re not already signed up, then sign up to our mailing list! 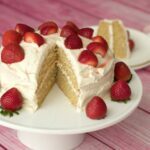 You get an awesome free ebook and you’ll stay up to date on all the fab new recipes posted to this site! 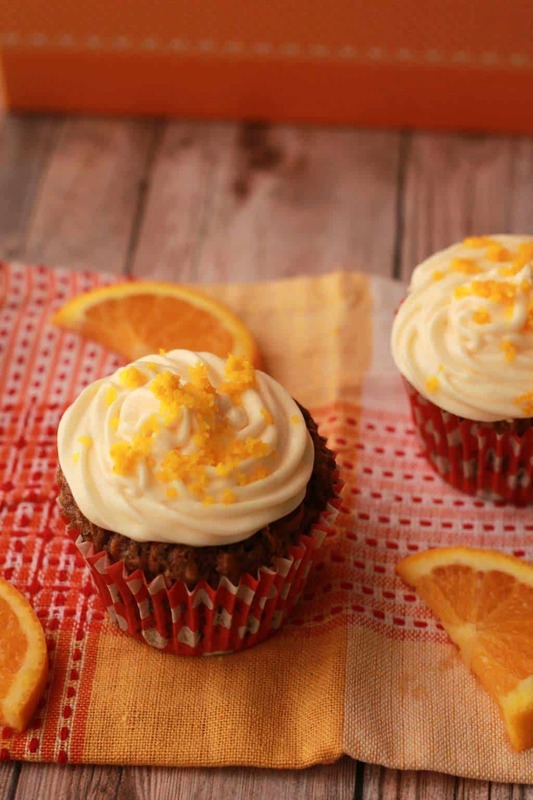 Deliciously moist vegan carrot cake cupcakes topped with orange cream frosting and orange zest. 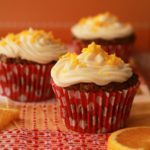 These cupcakes are a lot like muffins, they’re satisfying and nourishing and satisfy all cravings. Sift the flour and add to a mixing bowl with the brown sugar, baking powder, baking soda, salt, cinnamon and nutmeg. Mix together. Grate around 2-3 carrots and weigh them out, then add to the mixing bowl. 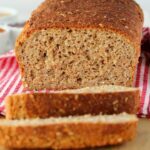 Prepare your flax eggs by mixing 2 Tbsp flaxseed meal with 6 Tbsp Hot Water and allowing to sit for a while to become gloopy. Add the flax eggs to the mixing bowl along with the vegetable oil, vanilla and apple cider vinegar. Mix in together. 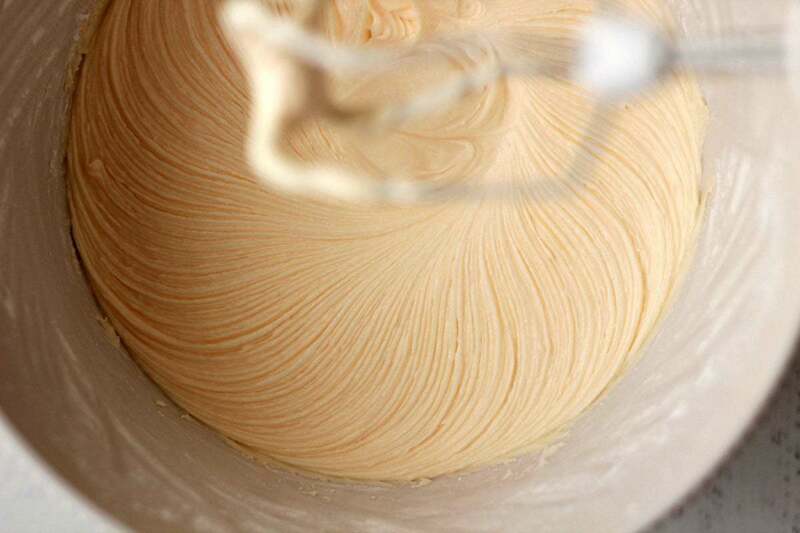 The batter will be very thick but keep mixing until it starts to meld together and form a thick batter. Prepare your orange zest by grating the skin of a whole orange. Get together roughly a tablespoon of zest and add to your mixing bowl. Place the walnuts in the food processor and pulse until they’re broken up into small pieces. Add the walnuts and mix in. 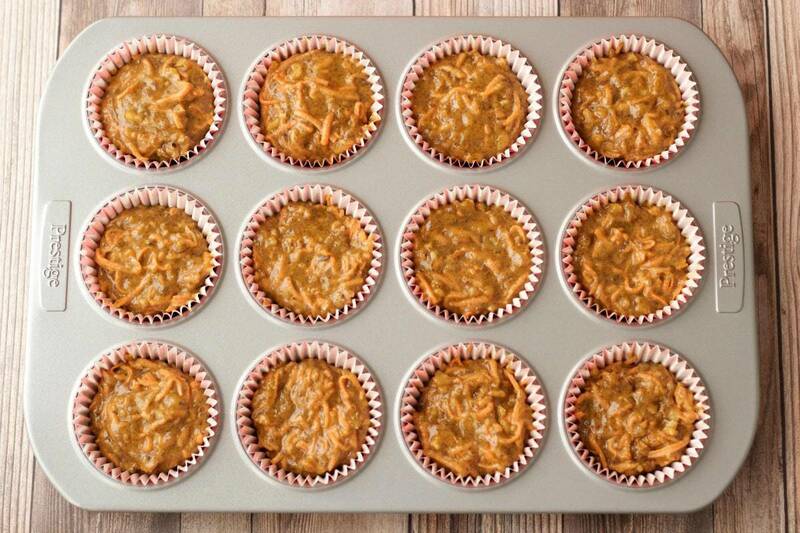 Divide the batter evenly between 12 cupcake liners. 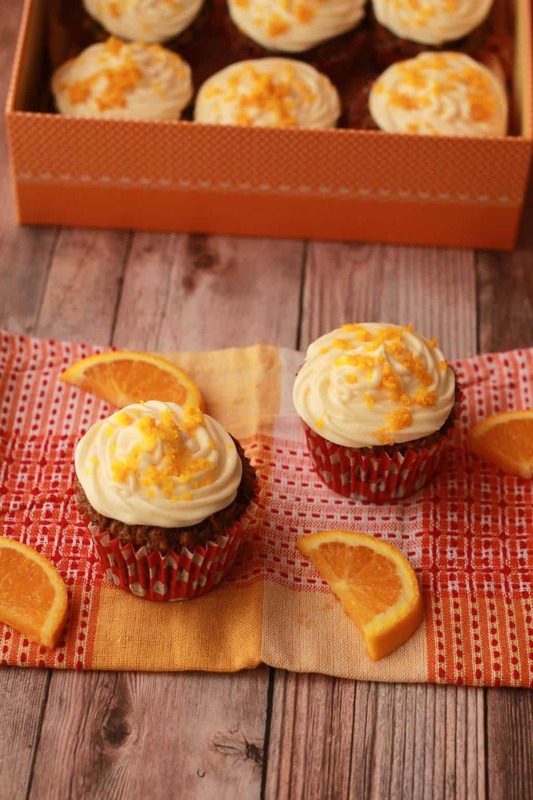 It’s best to use cupcake liners that are fairly high along the sides for these, or choose muffin liners. This is to avoid ‘muffin top’ that can happen with these cupcakes. Place into the oven and bake for 30 minutes or until a toothpick inserted into the center of a cupcake comes out clean (or very close to). 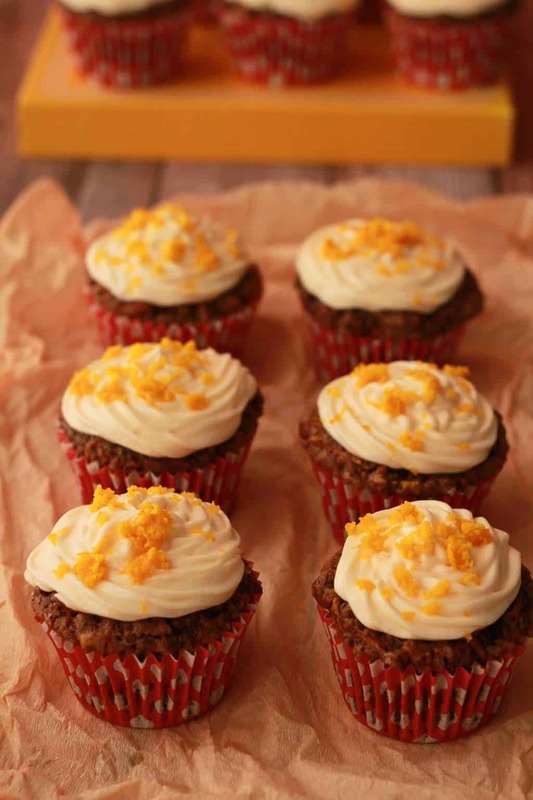 Remove from the cupcake tray immediately and place onto a wire cooling rack to cool completely. When the cupcakes are completely cool, prepare your frosting. 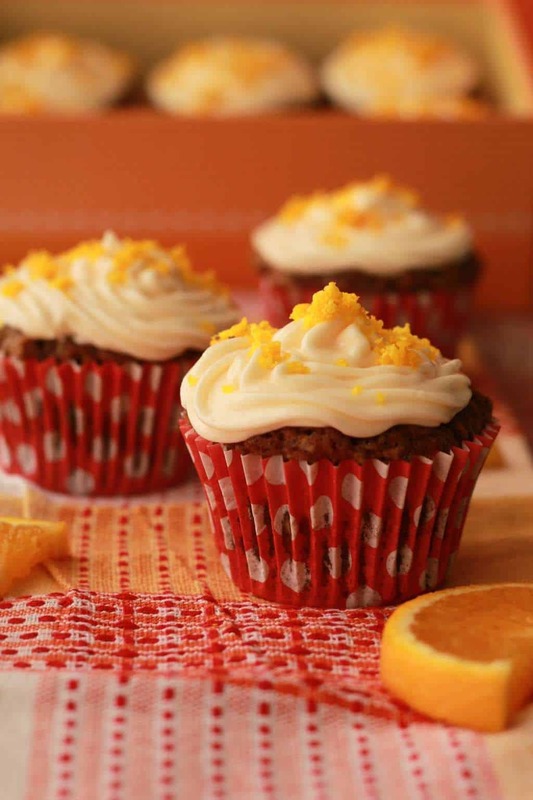 Add the powdered sugar, vegan butter, orange juice and orange essence to an electric mixing bowl and starting slow gradually increase speed until the frosting is thick and smooth. The frosting should be very thick. If it’s not then add more powdered sugar until it’s the right thickness. 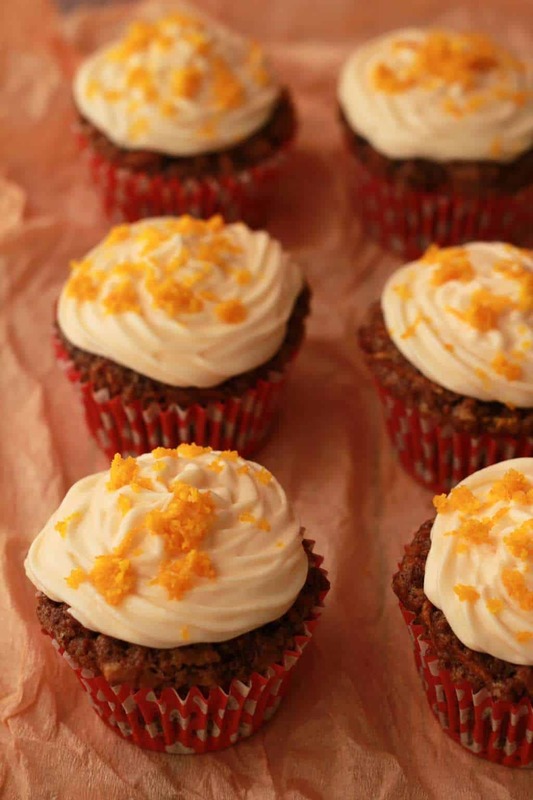 Pipe or spread onto the cupcakes and decorate with orange zest. *Based on my vegan carrot cake recipe. *Nutritional information is based on 1 cupcake (of 12) with a very generous amount of frosting. 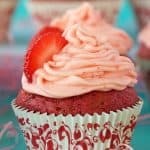 *It’s important to use muffin liners or cupcake liners that are go quite high on the sides for these cupcakes as they tend towards a muffin top when baking and without the high cupcake liners, they are harder to remove from the tray. Just made these and they are lovely. I didn’t have any flax so used apple sauce but it worked and they have turned out perfectly. 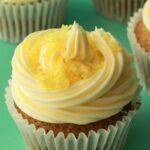 It’s the best vegan cupcake recipe I’ve tried and they have risen loads. Thank you for the recipe. Probably – melted and in the same quantity. Though I haven’t tried it, but I imagine this would work fine. I have made your carrot cupcake for the girls in the office quite a few times now and they are all gone by the end of the day!! They are amazed that they are vegan. Thank you for your recipe! I tried making the frosting by directions, and its all clumpy and no where neear looking like your frosting in pictures. It looks like some softened butter with a little color to it 😛 Any idea what the problem is? I assume you’re using an electric mixer? If so, then I have no idea why it would be like that, it’s usually quite straightforward. Baked these on the weekend and my family absolutely loved them! I Thank you. We have a friend that is vegan and I made these cupcakes for her. These cupcakes are delicious !! 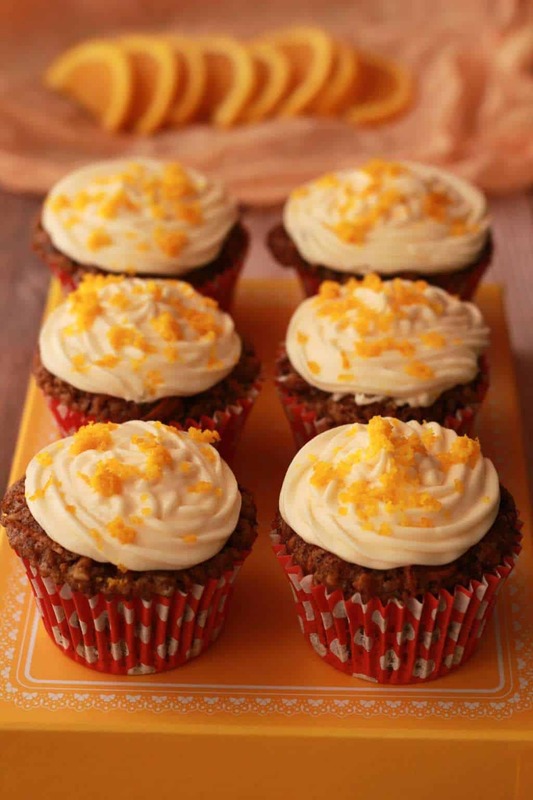 The closest to a traditional carrot cake cupcake. The frosting also is amazing. Even the non-vegans thought they were amazing. What do you think if I reduce it to 100 grams, does it change the texture too much? 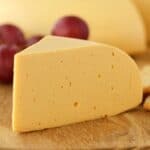 I’m pretty sure they wouldn’t be too unsweet for me, I am just wondering about the texture really. I can’t seem to find orange essence. Would orange extract work? I used whole meal flour, substituted lemon zest for orange and used pecans instead of walnuts. I also reduced the brown sugar to about 220 grams and added a quarter teaspoon of ground cloves. They turned out perfectly! I was really worried the mixture was too dry and was tempted to add more liquid but I’m glad I didn’t – the more you mix it the more moisture comes out of the grated carrot. It’s a very thick batter but the cakes turned out beautifully and were all gobbled up. My oven is fan-forced – I still had it set at 180°C and they took about 25 minutes to cook. I will definitely make these again! Wow! Thank you so much for this fantastic recipe. I made these cupcakes for a party and everyone absolutely loved them. I added a little bit of vanilla extract in addition to the orange extract in the icing, plus piped chocolate shapes to add as decorations in place of the orange zest. Totally delicious! What would the cooking time be if I made these in mini muffin pans? I made these this morning. I used 300 g of shredded carrots simply because that was exactly the amount of carrots I had and I figured why not. 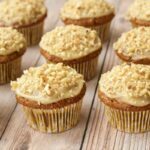 I also personally don’t care for frosting so I topped these with streusel and it was great! I made the streusel with 1 teaspoon cinnamon, 3 tablespoons all purpose flour, 3 tablespoons vegan granulated sugar, about 1/2 teaspoon orange zest, and 1 tablespoon of sunflower oil. Even with the extra carrots, they set really nicely and had a lovely texture, though I did get 16 muffins instead of 12. Because of the streusel they looked more like muffins than cupcakes, but I served them at noon so that was probably for the better. I served these muffins at a meeting to a bunch of carnists and everyone loved them. One person specifically complimented the orange zest. It’s a really nice addition. I’ll definitely make these again! Thanks for the recipe!